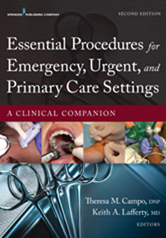 This is a concise, easy-to-use guide to executing more than 60 commonly performed clinical procedures, including sonography, in emergent, urgent, and ambulatory care settings. The procedures are consistently formatted, presented in detail, and organized into system-specific categories for easy access to information. Videos can be found at springerpub.com/campo through the links provided in this text.